Growing your own fruit is incredibly satisfying, and it’s a lot easier than you might think, but you will need to do some basic tree care to ensure a rich and regular crop. At first you’ll be protecting and fertilizing your young tree, and water could be essential depending on the species and your climate, but the main thing that needs done is pruning. That can seem like a daunting task, but if you stay on top of it there’s no need for it to be a big job. The key thing is doing it the right way at the right time – if you get it right you’ll be rewarded with an impressive harvest! To maintain general health. Trees slowly accumulate dead and diseased branches. It will be healthier if any diseased parts are cut away and disposed of – this will prevent the problem spreading, and also ensure the tree doesn’t waste resources on them. Dead branches can rot or attract fungi, and either of these problems might then spread to healthy wood. If you have severe winters the extra weight of ice on dead branches can also cause damage. To shape the tree. Left to their own devices fruit trees can grow into awkward shapes that make it hard to harvest the crop. For most species you want a lot of branches growing horizontal or close to it; this spreading shape makes it easier to get at the fruit when it’s ripe. Getting at high branches through a dense canopy of lower ones is a real struggle and you want to avoid this. To promote growth. Cutting a tree back, if it’s done at the right time, encourages vigorous new growth with lots of flowers – and, later, lots of fruit. So that’s why you should prune your trees. Now let’s look at when. If you find signs of disease don’t wait; prune it immediately. Even if it’s not the right time of year the risk of disease spreading outweighs any issues the pruning will cause. Dead branches can safely be pruned at any time but, depending on the tree, it might be easiest to spot them in late spring when the new growth is starting to appear; they’ll be the ones that don’t have any. Most pruning, though, is going to be the second and third types – to shape the tree or encourage new growth. In both cases it’s usually best to do this while the tree is dormant, for a couple of reasons. Firstly it’s just easier to see what you’re doing without the full summer foliage in the way. Secondly, if you cut the tree back before it starts its spring growth phase then all its resources will go towards new twigs and foliage on what’s left. That means more flowers to be fertilized and develop into fruit. The majority of fruit trees bloom in late spring or early summer, so your window for pruning might not be very wide. Aim to do it after the last frosts, to prevent freezing damage to the freshly cut ends, but before spring arrives. Be prepared for some remedial pruning later though. If a branch is hanging down excessively under the weight of its leaves it might be best to remove it before fruit starts to grow – otherwise it could tear loose and damage the trunk. The one time to really avoid pruning is in fall. Unless there’s a serious outbreak of disease it’s best to leave things alone until late winter, because cuts made in fall heal more slowly and the damp weather makes the raw surfaces an ideal environment for fungi. Many parasitic tree fungi also spread their spores in fall, so it’s a dangerous time to give them easy access to your tree. So that’s when to prune your trees, so how do you do it? First make sure you have the right tools to hand. A good stepladder is probably going to be essential unless the trees are very young. Then you’ll need pruning shears, a larger set of lopping shears and probably pole shears too. If branches more than an inch thick are going to be cut the chances are you’ll want a saw. And don’t forget protective gear. Pruning can throw out sawdust and wood splinters, so get decent protective glasses. If you’re going to be working above head height a hard hat is a good idea – chunks of branch falling on your head aren’t any fun at all. It can be tough on your hands too, so a pair of work gloves are essential. The first step in pruning is to identify which branches have to go. Sometimes this is obvious – dead or diseased ones, for example. Cut these away first so you have a better idea of what to do with the remaining ones. Identify any branches growing towards the center of the tree and remove them. They prevent fresh air and sunlight reaching in, and can end up in a dangerous and highly stressed tangle. For the same reason, remove any branches that cross over each other. If the tree has reached the maximum height you want, look for the leaders – the newest growth – at the tip of each top branch and cut away about two-thirds of it. Aim to leave two buds on each leader. For young trees your priorities are slightly different. This is your chance to get the tree into the perfect shape right from the start, so let the main stem grow but cut back the lateral ones until each has three buds along its length, plus any at the base. If new shoots start to grow from the laterals cut those too, leaving one leaf on each. When the tree gets to the height you want start pruning the leader of the main stem, letting it grow by two buds each year, and allow the lateral branches to spread out. These are where your fruit will grow, so they shouldn’t be pruned too much once the tree approaches maturity, but don’t let side shoots become too thick. Actual cuts should be made cleanly. If your shears can’t get through a branch in one cut, use a saw. When sawing through a branch make the initial cut on the bottom and go at least a third of the way through, or until the saw starts to bind. Then start a new cut from the top, very slightly outside of the first one. When you’ve gone far enough through the branch will break off cleanly under its own weight. If you just cut from the top it will sag and tear away, often causing a lot of damage to the bark. Cut branches off as close as possible to the trunk or main branch they’re growing from. Don’t leave stubs; aim to remove them at the very edge of the collar they’re growing from. Where possible cut so the raw surface isn’t facing upwards, as this increases the risk of water soaking in and causing rot. It can’t always be avoided, but do your best. 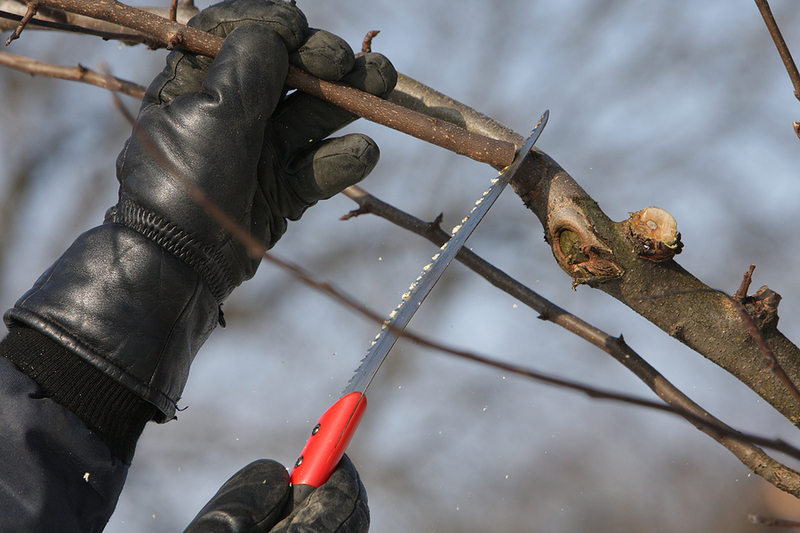 Pruning is really mostly about having the right tools and knowing what to remove, and for fruit trees it’s easy to work out when to do it – unless an urgent problem appears, always prune in late winter. Old gardeners like to scare people with tales of how difficult it is, but it really isn’t anything to be nervous of and it will make a huge difference to the health of your trees. I recently purchased 2 Elberta Peach trees. I’m in Massachusetts. They are very healthy with an abundance of leaves and are about 4 to 5 feet tall. What if anything should I be doing for them, now that the Massachusetts winter is about to arrive.